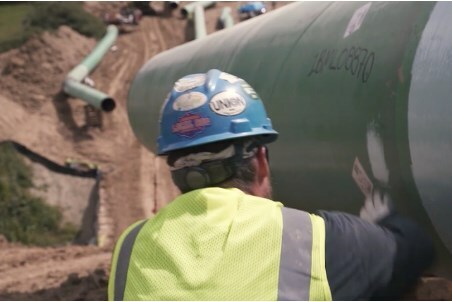 Williams reported yesterday that the Atlantic Sunrise pipeline project has achieved mechanical completion and 1.7 billion ft3/d of critically needed capacity is now ready to be placed in service pending final approval from the Federal Energy Regulatory Commission (FERC). "Williams reports mechanical completion of Atlantic Sunrise project"
The company requested such permission from the FERC yesterday. Backed by long-term shipper commitments, the nearly US$3 billion expansion of the existing Transco natural gas pipeline will connect abundant Marcellus gas supplies with markets in the Mid-Atlantic, including the Cove Point LNG facility, and the Southeastern US and is designed to increase natural gas deliveries by 1.7 billion ft3/d. Greenfield construction on the Pennsylvania portion of the project began in September 2017. The project has featured the installation of approximately 200 miles of large diameter pipeline, two greenfield compressor stations and compressor station modifications in five states. The segment of the project known as the Central Penn Line will be jointly owned by Transco and a third party. FERC initially authorised the project in February 2017, concluding that environmental impacts associated with the project would be reduced to “less than significant levels” with the implementation of mitigation measures proposed by the company and FERC. Additional information about the Atlantic Sunrise project can be found here. Transco delivers natural gas to customers through its more than 10 000 mile pipeline network with a mainline extending 1800 miles from South Texas to New York City. The system is a major provider of cost-effective natural gas services that reach US markets in 12 Southeast and Atlantic Seaboard states, including major metropolitan areas in New York, New Jersey and Pennsylvania.